Afrinvest Research says that Nigeria continues to reap the benefit of improved macroeconomic stability as shown by economic data releases by the National Bureau of Statistics (NBS) and Central Bank of Nigeria (CBN) last week. On Tuesday, the NBS released Q4:2017 GDP data wherein it reported activity rose 1.92% Y-o-Y in the Quarter, marking the 2nd consecutive expansion in growth since the economy exited recession in Q2:2017. The successive positive GDP growth recorded from Q2 – Q4:2017 offset the 0.9% Y-o-Y contraction in Q1:2017, resulting in FY:2017 actual growth of 0.83% Y-o-Y, 13bpd ahead of our initial projection of 0.7%. Though Q4:2017 actual growth (+1.9% Y-o-Y) was ahead of our estimate (+1.5% Y-o-Y), it lagged consensus estimate polled by Bloomberg at 2.1%. 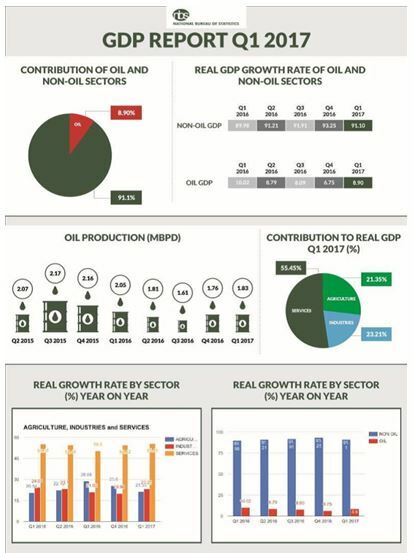 However, as we highlighted in our Note published earlier this week on the GDP report, there is a major positive to draw from the data despite the slight negative data surprise: unlike the oil sector driven rebound in aggregate output between Q2 – Q3:2017, growth was more broad-based in Q4 as the three major economic sectors – Industry, Services and Agriculture – expanded concurrently for the first time since Q4:2014. Our outlook for the economy remains positive as we expect Oil sector low-base-push to last till Q4:2018 – particularly considering oil production disappointed in Q4:2017 and new barrels are expected from Total’s Egina field by Q4:2018. Thus, we have raised Oil sector GDP growth projection from 8.8% to 11.8% Y-o-Y. Whilst structural constraints to non-oil sector growth – recurring energy scarcity, weak infrastructure and port congestion – remain headwinds, we note that the cyclical challenges will start to abate from 2018 against the backdrop of 1) anticipated expansion in fiscal spending as fiscal balance stabilizes and political parties spend ahead of the election, 2) further deceleration of inflation rate which will directly affect GDP price deflator and support real growth, 3) Increase in private investments due to favourable aggregate demand outlook and stable FX rate, 4) low-base effect of ICT sector which contracted in FY:2017 due to a 6.1% Y-o-Y decline in Active Voice subscribers and 5) declining market interest rates with anticipated knock-on impact on real sector lending which contracted in real terms in 2017. Thus, we have revised our FY: 2018 GDP growth projection upward to 2.6% from 2.1%. Further affirming consensus optimism on near term growth, the CBN released its PMI report for the month of February yesterday, showing an expansion in both Manufacturing and Non-Manufacturing sectors, albeit at a slower pace. The Manufacturing and Non- Manufacturing PMI settled at 56.3 and 56.1 points respectively in February, lower than 57.3 and 58.5 points in January 2018 – indicating that both sectors expanded in the reported month but at a slower pace. The upbeat performance of both the Manufacturing and Non-Manufacturing sectors is unsurprising, given the steady improvement the economy has recorded since Q2:2017 – buoyed by FX policy reforms, stable oil prices and production volumes which have had positive knock-on impacts on FX liquidity, fiscal spending and consumption & investment spending. We observed that the expansion in the Manufacturing sector was buoyed by growths across all sub-indices, with Employment Level, Raw Material Inventory and Supplier Delivery Time sub-indices rising at a faster pace M-o-M while New Orders and Production Level grew at a slower pace. Similar to the Manufacturing sector, all components of Non-Manufacturing PMI expanded, although momentum slowed in Business Activity and New Orders. Whilst rising Employment Level was a positive, slowing momentum in Production Level/Business Activity and New Orders across the two sectors remain a concern. Yet, we expect PMI data to continue to reflect expansions as near term growth outlook remains well anchored above 2.5%. The National Bureau of Statistics (NBS) released Q4:2017 data on capital importation yesterday and in line with expectation, capital importation improved, surging 247.5% Y-o-Y and 29.9% Q-o-Q to US$5.4bn in Q4:2017 – a level last seen in Q3:2014 – from US$1.5bn in Q4:2016 and US$4.1bn in Q4:2016. Though all categories of Capital Importation rose both Y-o-Y and Q-o-Q, as with previous Quarters, capital flows are still largely driven by Foreign Portfolio Investment (FPI) which rose 1123.5% Y-o-Y and 25.7% Q-o-Q to a 14-Quarter high of US$3.5bn in Q4.2017, while Other Investments (comprising of Loans, Trade Credits, Currency Deposit and “Other Claims”) jumped 66.0% Y-o-Y and 21.2% Q-o-Q to US$1.5bn and Foreign Direct Investment (FDI) increased 9.8% Y-o-Y and 221.8% Q-o-Q to US$378.4m. FPI in the Quarter was supported by Fixed Income investment related flows (Money Market Instruments and Bonds) which cumulatively rose 197.9% Q-o-Q to US$2.5bn to offset 48.8% Q-o-Q drop in portfolio flows to the equity market which fell to US$989.2m. The surge in Q4 capital importation took cumulative Capital Importation in FY:2017 to a 3-year high of US$12.2bn, 138.5% higher than US$5.1bn recorded in FY:2016 and the highest since US$20.8bn in FY:2014. Foreign Portfolio Investment (FPI) remains the biggest vehicle through which capital flows into the country, rising fourfold to US$7.3bn in FY:2017 and accounting for 59.9% of total capital flows. Other Investments also jumped 72.8% to US$3.9bn while FDI remains a source of weakness as it declined 6.0% Y-o-Y to a record low of US$981.8m. Increased policy flexibility in the foreign exchange market and stability in current account – following rally in oil prices and rebound in domestic production volumes – were the major factor drivers of the surge in capital importation in 2017 which in turn bolstered FX market liquidity. We anticipate capital inflows into the economy to remain upbeat in the first half of the year on the back of increased foreign investor participation in the financial market and external deficit financing strategy of the Federal Government. Major downside risk to near term capital flows include polity stability ahead of 2019 elections, fragility in global oil market conditions and pace of policy normalization by systemic central banks in advanced markets. The domestic bourse halted a 3-week long bearish performance this week on the back of increased buying interest in market bellwethers as earnings results begin to trickle in. Accordingly, the NSE All Share Index (ASI) rose 0.7% W-o-W to settle at 42,876.23 points while YTD return improved to 12.1%. Furthermore, market capitalisation increased by N126.0bn to N15.4tn. Similarly, activity level strengthened as average volume and value traded improved 7.5% and 79.9% W-o-W to 403.1m units and N9.1bn respectively. The top traded stocks by volume were FCMB (237.4m), CCNN (167.6m) and TRANSCORP(154.0m) while the top traded stocks by value were NESTLE (N5.2bn), GUARANTY(N4.3bn) and CCNN (N2.9bn). A mixed performance was recorded in the market this week as the NSE ASI advanced on 3 of 5 trading days in the week. The benchmark index started the week flattish with a 2bps appreciation but declined 0.7% on Tuesday following sell offs in DANGCEM, ZENITH and INTBREW. On Wednesday, the ASI rebounded, gaining 2.4% against the backdrop of renewed interest in Industrial and Consumer Goods Bellwethers – DANGCEM, NIGERIAN BREWERIES and NESTLE. 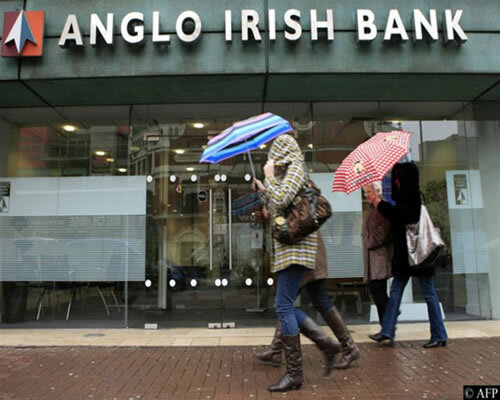 However, on Thursday the ASI dipped 1.1% due to profit taking before improving 0.1% on Friday. All sector indices advanced, save for the Banking index which declined 0.6% W-o-W on the back of profit taking in GUARANTY (-0.2%) and ZENITH (-1.1%). On the gainers’ chart, the Oil & Gas Index was the top advancer, up 1.6% W-o-W, due to gains in TOTAL (+6.4%) and SEPLAT (+2.2%). Interest in the latter was buoyed by the release of an impressive FY: 2017 earnings scorecard whilst the performance in the former was driven by attractive dividend yield of 6.5% as at declaration. The Insurance index trailed, up 1.5% W-o-W as NEM (+18.4%) and HMARKINS (+16.0%) closed in the green. Similarly, the Industrial and Consumer Goods indices gained 1.2% and 0.9% respectively due to price appreciation in DANGCEM (+1.9%), NIGERIAN BREWERIES (+0.8%) and NESTLE (+1.6%). This week, 37 stocks closed in the green while 44 stocks declined. Hence, market breadth (advance/decline ratio) strengthened to 0.8x from 0.4x in the previous week, indicating an improvement in investor sentiment. JAPAUL OIL (+50.0%), UNITY (+18.8%) and NEM (+18.4%) led gainers this week while SOVEREIN (-20.8%), UNIC (-18.5) and MULTIVER (-17.6%) led laggards. As more companies file FY: 2017 earnings results in the coming week, we expect investors to take position in fundamentally sound dividend paying stocks. Hence, we anticipate a largely positive performance in the coming week. Money market rates fell all week as liquidity improved against the backdrop of monthly FAAC allocation which hit the system and repayment of maturing OMO and Treasury Bills. The Open Buy Back (OBB) and Overnight Rate (OVN) rates closed the first trading session of the week at 7.9% and 8.8% respectively, down 3.6ppt apiece from 11.5% and 12.4% recorded on Friday as expectation of monthly FAAC allocation inflow offset Naira outflow associated with CBN’s weekly FX auction of US$210.0m. System liquidity surged on Tuesday, to N500.9bn, as the monthly FAAC inflow hit the system, driving OBB and OVN rates down to 5.0% and 5.6% respectively. Rates continued to moderate till mid-week as liquidity remained robust, falling to the week’s lowest point on Thursday (3.1% and 3.4% for the OBB and OVN respectively). The robust liquidity witnessed in the system was on the back of inflows (N260.0bn T-bills maturity and N109.0bn OMO maturity) which offset various mop ups conducted during the week. N249.7bn of 254-day and N276.8bn of 259-day tenors were allotted through OMO auctions at marginal rates of 14.4% on Tuesday and Thursday respectively while at the T-bills PMA held mid-week, a total of N129.9bn was offered (compared to a maturity of N260.0bn) and allotted across the 91-day (N12.9bn), 182-day (N64.9bn) and 364-day (N51.9bn) maturities at stop rates of 11.9%, 13.5% and 13.5% respectively. We suspect the T-bills repayment was partly financed with proceed from recent Eurobond issuance as earlier guided by the DMO. Liquidity tightened on Friday, as the CBN debited Money Market Dealers for Thursday’s OMO auction; hence, OBB and OVN closed at 9.8% and 10.0%, down 1.7ppt and 2.4ppt W-o-W respectively. In the Treasury Bills Market, average rate across benchmark tenors fell to 13.8% on Monday from 14.0% quoted on the previous Friday and stayed flattish at 13.8% till Thursday. The marginal decline experienced during the first three trading days was a reflection of investors’ anticipation of inflows into the system. On Thursday however, average rate increased 28bps to 14.0% and closed the week at similar levels indicating a 4bps decline W-o-W. In the coming week, N130.0bn worth of OMO bills will be maturing and we expect the CBN to conduct OMO auctions to mop-up liquidity in order to align with its goal of FX rate stability. In line with trend, the CBN continued with its weekly market intervention, injecting US$100.0m through the Special Intervention Sale into the foreign exchange market to maintain stability across different segments of the market as well as sustain liquidity levels. At the Investors & Exporters FX window, the NAFEX rate shed 3kobo at the start of the week to close at N360.19/US$1.00 from N360.16/US$1.00 recorded the previous Friday. However, the rate strengthened 4 kobo at close of trade on Tuesday to N360.15/US$1.00 before paring gains by midweek, shedding 10 kobo to settle at N360.25/US$1.00. On Thursday, NAFEX rate closed at N360.14/US$1.00, up 11 kobo from the previous session before closing the week at same level, translating to a 2 kobo W-o-W depreciation. Activity level at the I & E Window improved as total turnover inched 64.8% higher to US$1.2bn (as of Thursday) from US$913.6m recorded the prior week. At the parallel market, the naira weakened 1 Kobo to open the week at N363.00/US$1.00 and stayed flat till Thursday before appreciating 1 kobo on Friday to close the week at N362.00/US$1.00. At the FMDQ OTC futures market, total value of open contracts of the Naira settled OTC futures stood at US$3.2bn on Thursday – 4.0% (or US$132.9m) lower than US$3.3bn recorded the prior week. Despite the decline in market size, the NGUS JAN 2019 and NGSU NOV 2018 instruments received additional subscriptions to the tune of US$25.0m and US$40.75m, which translated to a 135.3% and 19.0%W-o-W increase. The APR 2018 instrument remains the most subscribed with a total value of US$657.92m (contract price: 360.59) while the least subscribed was the JAN 2019 instrument which had a total value of US$43.48m (contract price: 362.27). In the coming week, we expect rates to continue to trade within tight bands as the CBN is expected to continue with its weekly interventions to maintain stability in the FX market. Performance in the local bond market was largely bearish this week as average yield rose on 3 of 5 trading sessions. The week opened on a relatively quiet note as average yield across benchmark instruments closed flattish at 13.7%, rising a marginal 2bps from the previous Friday. This was on the back of slight selling pressure on the MAR 2036 and MAR 2027 (up 7bps apiece) bonds as well as the JUN 2019 instrument (up 5bps) while buying interest was observed in the FEB 2020 and MAR 2024 instruments as yields declined 4bps and 3bps respectively on both. On Tuesday, yields across maturities traded relatively flat with some buying interest recorded on APR 2037 (-2bps) and shorter tenored FEB 2020 (-8bps). Yields remained broadly flat till mid-week although bullish sentiment was observed on longer tenored instruments – APR 2037 and MAR 2036 (down 2bps apiece). However, by Thursday, renewed buying interest in short tenored instruments pushed average yield marginally lower (1bp) to close at 13.7% before declining 2bps on Friday to settle at 13.7%. In the Sub Saharan Sovereign Eurobond Market, performance was largely mixed albeit slightly bearish as yields on 14 of 22 instruments under our coverage rose W-o-W. The bearish sentiment is in line with continued repricing of fixed income securities in global markets as new Fed Governor, Jerome Powell gave an optimistic assessment of the US economy and hinted at further rate hikes. Nigerian Eurobonds witnessed the most sell off with yields on 5 of 6 instruments rising W-o-W. However, the JUN 2018 instrument recorded buying interest (YTM fell 10bps W-o-W). In comparison, the South African Eurobonds witnessed the most buying interest as markets cheered decision by President Ramaphosa to reshuffle cabinet, particularly the appointment of Nhlanhla Nene as new finance minister. In contrast to performance of Sovereign Eurobonds, appetite remains strong for Nigerian Corporate Eurobonds as yields fell W-o-W on 6 of 11 instruments we track. DIAMOND 2019 (down 34bps to 9.1%) received the most buying interest while the ZENITH 2019 (up 10bps to 4.1%) recorded the highest increase in yield. The best performing bonds, in terms of YTD price change, are FBN 2021 and DIAMOND 2019 with YTD return of 3.6% and 3.1% respectively.